Today was my last day in the window. As Suzi promised, Saturdays in Staunton bring a lot more foot traffic on the main street, almost all tourists, it seemed, although I recognized a few locals. Several clusters stopped and watched for a few minutes before moving on. A few came into the store, although no one approached me today. Kind of a disappointment. But I actually made good progress on a story I’m working on, and when I ran out of steam on that I started a new one. So it was a pretty good day. 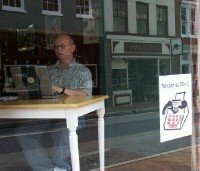 I contemplated staying longer this afternoon to see if there would be any more interest, but a writer can sit in the window only so long.